This infographic is shared with a Creative Commons Attribution license. You are free to adapt and re-use this infographic, provided you include the attribution listed below in your re-use of the work. 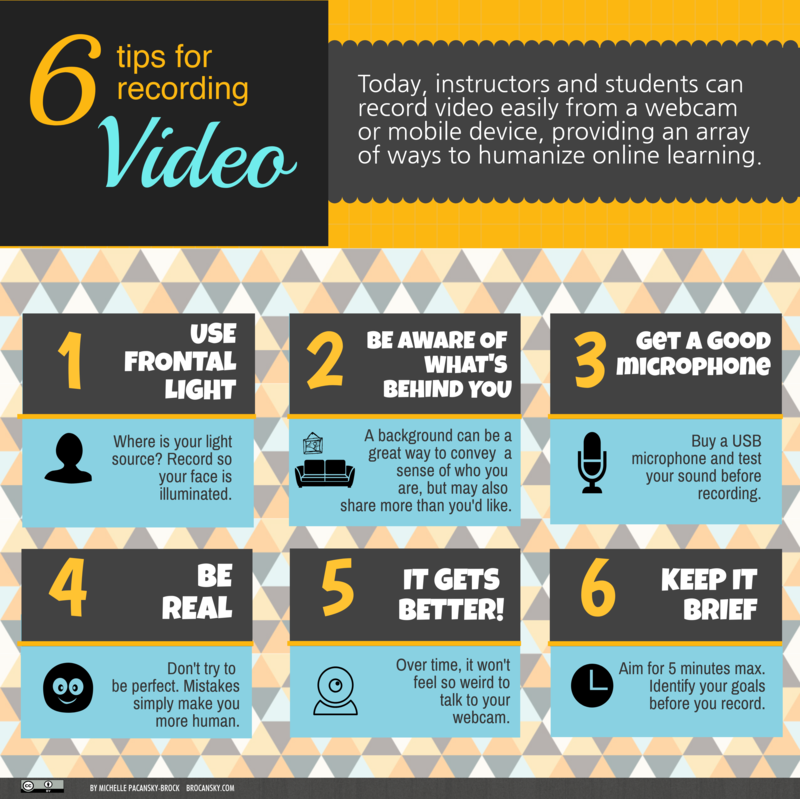 6 Tips for Recording Video by Michelle Pacansky-Brock is licensed under a Creative Commons Attribution 4.0 International License. Based on a work at http://brocansky.com/6-tips-recording-video-infographic. <a rel="license" href="http://creativecommons.org/licenses/by/4.0/"><img alt="Creative Commons License" style="border-width:0" src="https://i.creativecommons.org/l/by/4.0/88x31.png" /></a><br /><span xmlns:dct="http://purl.org/dc/terms/" href="http://purl.org/dc/dcmitype/StillImage" property="dct:title" rel="dct:type">6 Tips for Recording Video</span> by <a xmlns:cc="http://creativecommons.org/ns#" href="http://brocansky.com/6-tips-recording-video-infographic" property="cc:attributionName" rel="cc:attributionURL">Michelle Pacansky-Brock</a> is licensed under a <a rel="license" href="http://creativecommons.org/licenses/by/4.0/">Creative Commons Attribution 4.0 International License</a>.<br />Based on a work at <a xmlns:dct="http://purl.org/dc/terms/" href="http://brocansky.com/6-tips-recording-video-infographic" rel="dct:source">http://brocansky.com/6-tips-recording-video-infographic</a>. 6 Tips for Recording Video. Today, instructors and students can record video easily from a webcam or mobile device, providing an array of ways to humanize online learning. 1. Use Frontal Light. Where is your light source? Record so your face is illuminated. 2. Be Aware of What's Behind You. A background can be a great way to convey a sense of who you are, but may also share more than you'd like. 3. Get a Good Microphone. Buy a USB microphone and test your sound before recording. 4. Be Real. Don't try to be perfect. Mistakes simply make you more human. 5. It Gets Better! Over time, it won't feel so weird to talk to your webcam. 6. Keep It Brief. Aim for 5 minutes max. Identify your goals before you record.